You are currently browsing the tag archive for the ‘Synthetic Ecosystem’ tag. My first job was an unpaid internship at the Smithsonian Institution’s Marine Systems Laboratory in Washington DC during the summer of 1993. The Smithsonian was operating and monitoring a partially closed synthetic ecosystem within a large greenhouse—in effect they had built a huge terrarium. This ecosystem was built to mimic a tidal mangrove swamp: tiny locks allowed small amounts of saltwater to flow out of a central “ocean” and back into a multi-staged brackish mangrove swamp in imitation of natural tidal flux. The highest part of the system was a reservoir of fresh water. This was allowed to continuously trickle down a creekbed through a little deciduous freshwater forest. 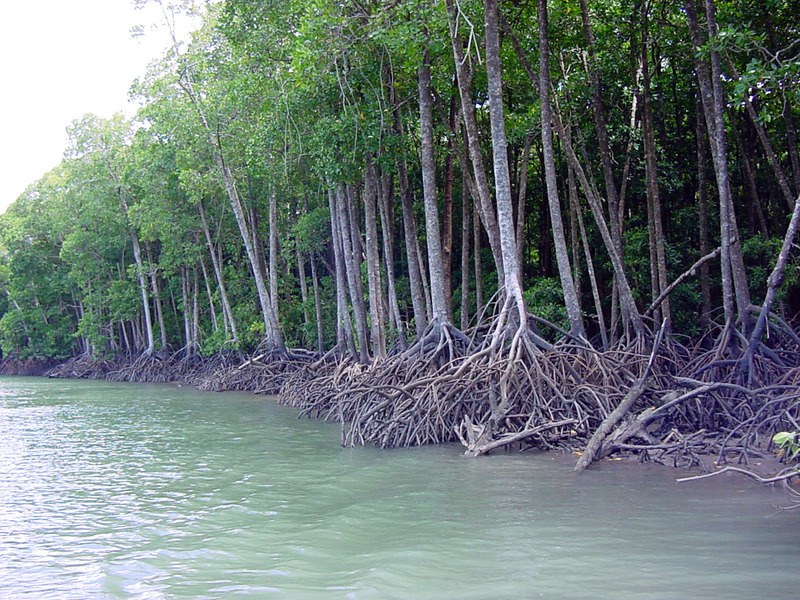 There were then several multiple stages of mangroves varying from true mangroves, which practically had their roots in the “ocean”, to brackish trees, to trees which were only exposed to a tiny amount of saltwater on the highest Proxigean Spring Tide (the system of locks was ingeniously constructed to mimic these rare occurrences ), to the sweetwater trees around the “creek”. The system had been in operation for many years and a lot of strange things had happened. All of the egg laying fish in the ocean (actually a large deep saltwater pool) had died out except for a couple of strong-willed sea bass who acted as apex predators. The fish which remained were all small live-bearing fish which reproduced viviparously and did not require vasty oceans for their eggs to hatch and for their fry to grow up in. The Florida lizards, turtles, and insects had all vanished (although there were unconfirmed lizard sightings). The animals which did flourish were tiny sea anemones, tube worms, sponges, and hydras. These little invertebrates could be found sticking to everything in the ocean and the brackish pools. The biologists assured me that an even greater number of microscopic invertebrates were reproducing themselves. Two large rock crabs were still on the scene dominating the oyster shell beach. I believe there were a handful of mollusks left but I never found out. The habitat was not closed. Scientists added water when necessary and the greenhouse windows were opened albeit screened. Additionally, human visitors–including the wacky bio grad students who ran the place–had free access. This meant that a whole host of invasive species had showed up. The most dangerous outsiders were scale insects which came from the giant greenhouses next door (where the immense national orchid collection was housed). Occasionally sparrows would get in. Somebody had put some African cichlids in the fresh water reservoir–where they were thriving. My favorite job at the mangrove was to impersonate tropical storms. I would run around and squirt everything with a high-pressure hose and kick and shake the plants (it was discovered that the trees and plants started having troubles if not routinely abused). I would spend whole afternoons pulling up sawgrass and plucking scales from mangrove trees. More prosaically, I cleaned up algae from the ocean and freshwater filters—which basically consisted of water running over large beds of algae. It was a fun job with fun people but it was tinged with sadness to record an ecosystem slowly and gradually declining. What was the purpose of the giant terrarium you might ask? It was built to observe the small flora and microfauna of a tropical mangrove ecosystem. 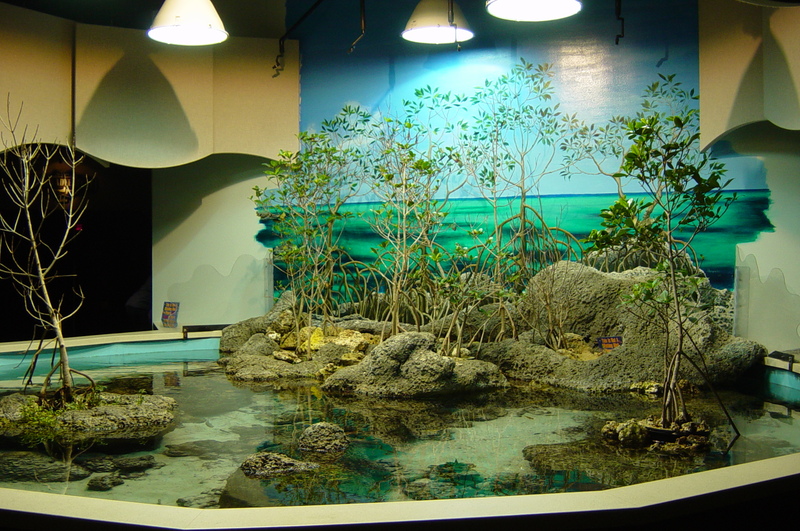 It was also a precursor and prototype to Biosphere 2 (the principal scientist/engineer behind the Smithsonian synthetic mangrove pulled out of Biosphere 2 when it was revealed that the oceans would not be built of limestone!). The whole system was an early attempt at creating a large scale contained ecosystem. Ecologists hoped to better understand the wildly complicated nature of real ecosystems through looking at these controlled macrocosms. 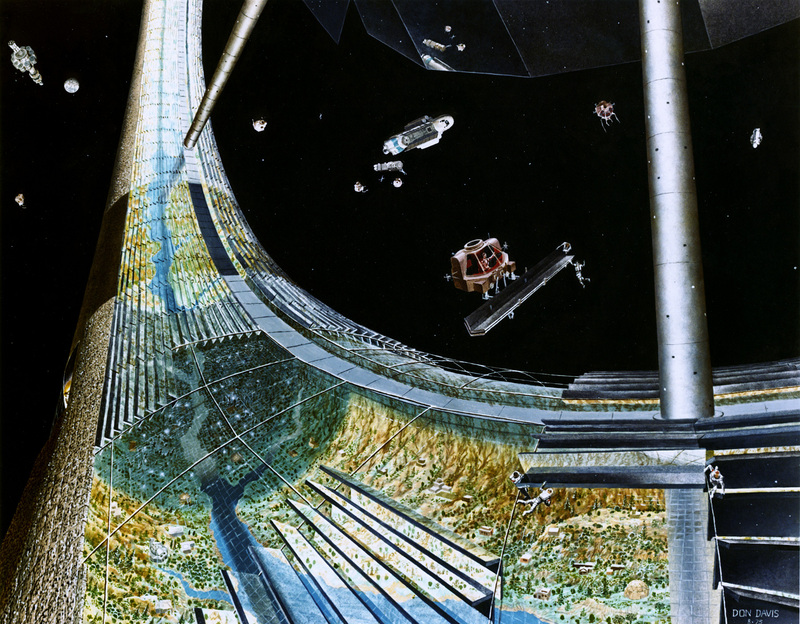 Closed ecosystems were also coming to the attention of NASA and space scientists who were starting to think about building synthetic ecologies for space stations (or even other worlds). The complexity, scope, and failures of that miniature mangrove swamp were a first taste of how complicated such a project truly is.